Especially in light of a recent article in the Guardian reporting that most adults in poorer nations think the future looks brighter for their youth, whereas wealthier nations think the outlook is dismal for their children and future generations. As we spread the Good News of the Gospel around the world, we believe God’s Word can make a difference anyone’s life, bring hope for a better future no matter their current circumstances. Take François’s story, for instance. François’s and his widowed mother lived in desperate poverty in Madagascar, where a strange fusion of ancestor worship and “Christianity” co-exist. Friends and neighbors tried to persuade François and his mother to dig up and cleanse the bones of their ancestors in order to appease the spirits that were causing their miserable life circumstances. Every day, François’s mother scavenged for vegetables to sell at the market. On a good day she made enough to buy a little rice; on any given day they ate the meager, unsold vegetables; and on a bad day they simply did not eat. Things got so bad that François’s mother relinquished him to a family member, hoping that he would be fed and cared for. But his uncle who used him for slave labor mining for gold. Unfortunately, after much abuse and starvation, François learned that he was worth more to his uncle if he was sold as a slave than the free labor he could provide. After overhearing his uncle making plans for his sale, François escaped, begged money to call his mother from a pay phone and returned home even more despondent than before. He joined his mother gathering vegetables to sell for an occasional meal of rice to keep them alive. When a OneHope team arrived to show The GodMan film and distribute the Book of Hope at the Catholic school in François’s town, the school director asked our team if non-students could also be included in the showing and distribution. 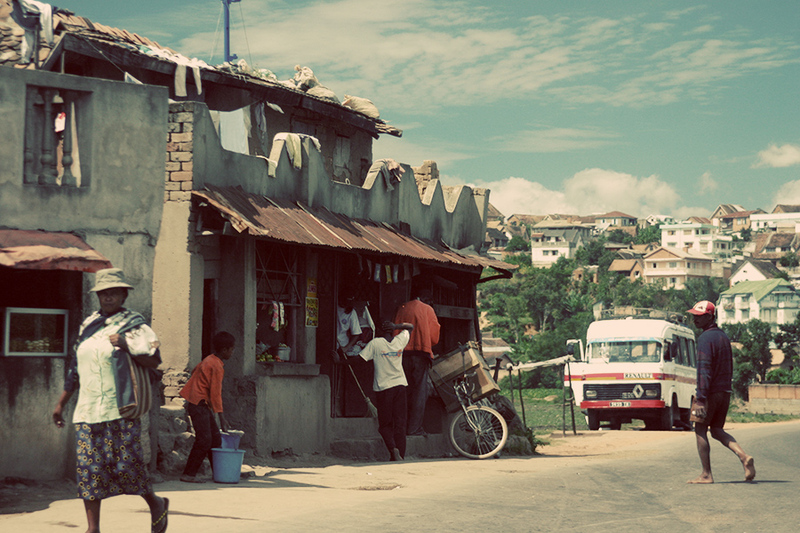 Nearly half of all children in Madagascar are unable to afford or attend school. The team responded with a resounding yes. “The Word of God is for everyone!” they assured him, not just for those fortunate enough to go to school. After viewing The GodMan film and receiving his own copy of the Book of Hope, François gave his life to Christ. He has since shared the plan of salvation with his mother and become active in a local church that is discipling him in his faith journey. François is turning into an enthusiastic evangelist, telling everyone he knows the story of Jesus and how they, too, can find hope in Him. Is François still living in abject poverty? Yes. But now he has something that no hunger pangs, lack of earthly father or schooling can steal from him. He has hope and an unabashed optimism that drives him to share his powerful story of how Jesus gave him a second chance at life, much like the second chance at life he got after escaping from his abusive uncle and narrowly missing his fate of being sold as a slave. Stories like François’s help transcend the tragedy and hard situations around the world we know children and youth are facing, and remind me that as we spread God’s Word, we are bringing hope. And that is how I’m gonna be an optimist about this. Optimism part 2– Why are poorer nations more optimistic than rich ones? The Bible App for Kids–this changes everything! François’s story was originally featured in my book, Hope Delivered: Affecting Destiny through the power of God’s Word.